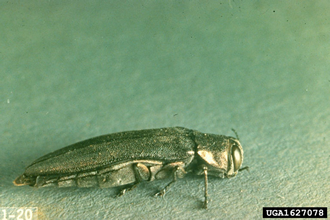 Bronze birch borer affects many species of forest and shade trees. Bronze birch borer frequently kills birch trees by boring into the wood. Bronze Birch Borer Current Day Forecast. Bronze Birch Borer 6-Day Forecast. Help us improve these maps! Our Pheno Forecast map products are still in development, and we seek input on their performance in your area. Give your feedback on the sidebar on the right side of this page. 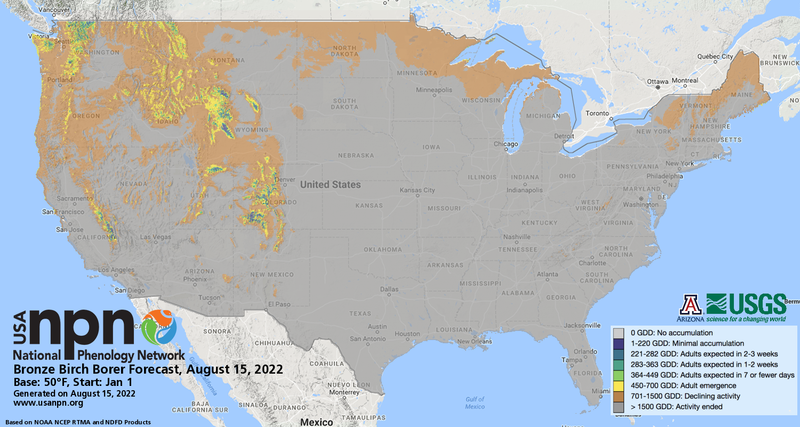 Pheno Forecast maps predict key life cycle stages in invasive and pest species, to improve management efficacy. 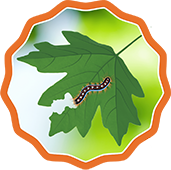 For insect pest species, Pheno Forecasts are based on published growing degree day (GDD) thresholds for key points in species life cycles. These key points typically represent life cycle stages when management actions are most effective. These maps are updated daily and available 6 days in the future. Bronze birch borer (Agrilus anxius) is wood-boring beetle that is native to North America. 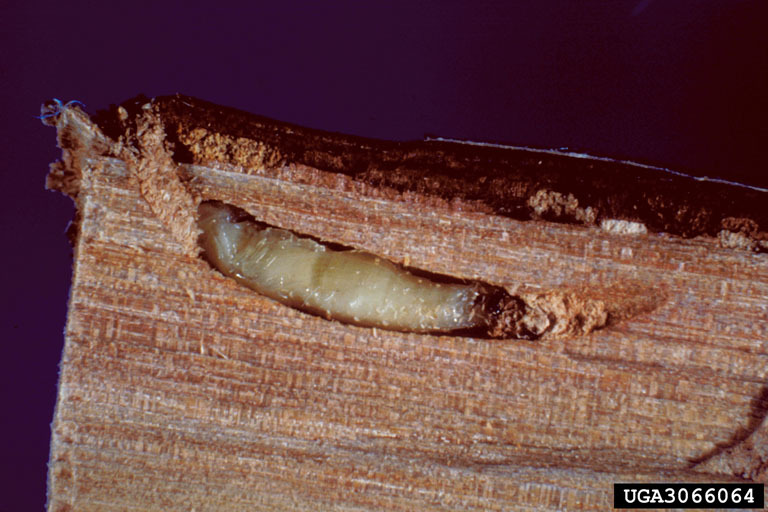 Periodic outbreaks of this borer have led to widespread mortality of birch (Betula spp.) trees; beech (Fagus spp.) trees can also be affected. We forecast adult emergence based on the accumulation of growing degree days. One approach for controlling bronze birch borer is to treat with herbicide when adults begin to emerge, with the goal of controlling newly hatched larvae before they burrow into the bark and are no longer susceptible to control. For specific information on preferred treatment options in your region, we recommend contacting your local extension agent. Additional treatment resources are available through Missouri Botanical Garden.